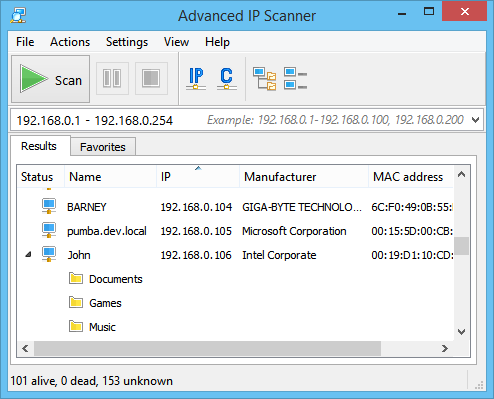 Advanced IP Scanner is a fast, robust and easy-to-use free IP scanner for Windows. In a matter of seconds, this utility finds all the computers on your network and provides easy access to their various resources, whether HTTP, HTTPS, FTP or shared folders. With Advanced IP Scanner, you can wake up and shut down remote groups of Windows machines. If you use Radmin remote access software, you will also enjoy the improved Radmin Server detection and integration capabilities, which allow you to connect to any scanned machine with Radmin Server.